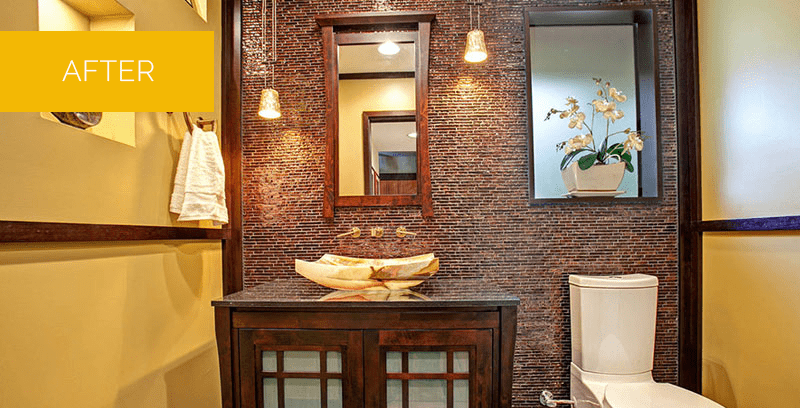 This multiple-award winning powder room conveys a glittering sense of drama in a small space. The clients wanted to express their affinity for Asian and contemporary themes in a seductive atmosphere. 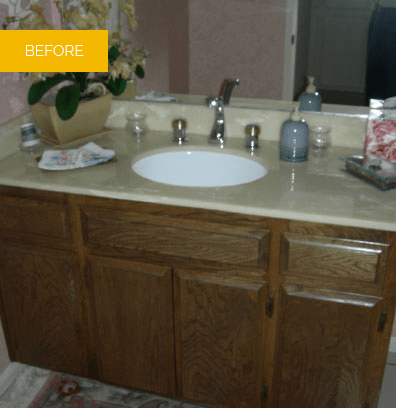 They frequently entertained guests from their professional circle and wanted a new powder room to make a memorable, dramatic impression. The experience of a visit to this powder room with its Asian-inspired glamour and sophisticated design discipline is now unforgettable. The room is entered through a simple, elegant black pocket door with Shoji-style panels, replacing the existing swing door. A wall was built to conceal the venting system, allowing for the addition of a free-standing vanity. An impressive wall of tile gleams in deep hues of ebony, gold and dark brown, illuminated by gold leaf lighting. Activated by sensor when entering the room, the lighting is designed on a cable system with weights to adjust the height – a functional solution with Asian roots. A curved mirror with a rustic Asian-themed wood frame is the backdrop for a stunning arced onyx sink with gold fixtures. The sink appears to glow with creamy luminescence atop the free-standing vanity with Shoji-style doors. The sliding window above the toilet was replaced with a fixed window with obscure glass, reducing clutter and adding light to the room. A natural stone floor in dark black with sparkles of metallic gold is a striking foundation for this extraordinary room.